The inspiration for this column began with an amiable, enthusiastic man called Zorawar Kalra, who tempted me into trying a tandoori duck at his three-month-old Delhi restaurant, the Punjab Grill (it will open shortly in Mumbai at Palladium in Phoenix Mills). I do not usually make trips to malls in south Delhi. I have never made one at midday to a place I abhor: the Select Citywalk mall, a haven for consumerism and crowds. 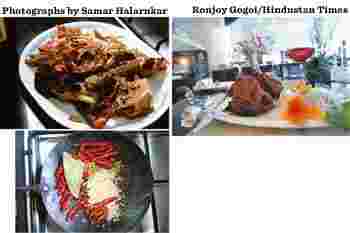 Duck’s back: (clockwise from above) Tandoori Duck at Punjab Grill, New Delhi; to prepare the marinade for Duck in Rum and Roasted Spices, roast the spices whole; the taste of the home-made duck improved the next day. On Zorawar’s urging, I sat down and waded through a wonderful six- or seven-course tasting menu, including soft galouti kebabs redolent with a bouquet of spices; a flaky, fragrant salmon kebab; and a remarkable guchchi pulao, as in mushroom and rice (except these were no ordinary mushrooms but Kashmiri morels, which cost Rs15,000 per kg in season, stuffed with paneer and khoya and steamed with the rice). But the high point was the tandoori duck, which I earlier watched being cooked in the Punjab Grill’s minuscule, congested but wonderfully creative kitchen. The duck is just the kind of thing Delhi’s globalized Punjabi loves—exotica with the flavour of home. At Rs1,050 (plus taxes), it is expensive, Zorawar says, but it feeds four people, so I reckon that’s not bad. The duck is marinated partially, cooked gently without charring in a handi (pot) and kept aside for its final 15-minute plunge into the 900 degrees Fahrenheit (480 degrees Celsius) tandoor. I love duck, but the meat can often be tough. The Grill cooks the duck with great finesse, and you can literally pick the meat off the bone. The meal inspired me enough to make my first attempt at a 3kg, home-made duck. I first marinated it with the skin on (see recipe). My battered oven was clearly no tandoor. After some shoving, I squeezed it on to my baking dish, where it sat for the next 4 hours, roasting away at a low-medium oven setting of 3, enough to keep cooking and browning without burning. It needed continuous basting (I alternated its own fat with a cup of leftover marinade mixed with orange juice) and when some ungainly limbs showed signs of extra browning, I hastily slapped some foil on them. The result: It didn’t come off the bone like Zorawar’s duck, but it made for a hit Sunday lunch in our little garden. Jiggs was generous enough to share his recipe. If you get past it, do read my humbler version. The first marination: Put vinegar and orange juice in a saucepan and reduce by half over low heat. Remove to a bowl and cool. When cool, add the remaining ingredients and mix well. Evenly rub the duck breasts with this marinade and reserve in the refrigerator for 3 hours. The second marination: Put all the ingredients in a bowl, mix well, remove duck from the first marinade, evenly rub with the second marinade and keep in the refrigerator for 1 hour. Pre-heat the oven to 350 degrees F (176 degrees C). Skewer the duck breasts, without any gaps, and keep a tray underneath to collect the drippings. Roast in a moderately hot tandoor for 7-8 minutes. Then on a charcoal grill, for about the same time. And in the pre-heated oven, for about 10-12 minutes. Remove and hang the skewers to allow the excess moisture to drip off (approx. 3-4 minutes), baste and roast again for 3-4 minutes. Roast the spices whole until they crackle and release aromas. Grind the roasted spices and apply to the skin of the duck and under it. Add rum, vinegar and salt. Ensure the marinade is well applied. Let the duck marinate overnight. Pre-heat the oven and place the duck on the baking tray. Roast for 4 hours at least, in low to medium heat. Watch the duck carefully and reduce the heat if there are signs of burning. Alternatively, cover the areas that are browning fast. Remove from the oven when cooked, carve carefully. Leftovers stay well, and the taste, like meat, improves after a day.